Anil Ambani’s Reliance Communication is unlikely to go for pan-India spectrum trading or sharing with Reliance Jio Infocomm. Instead, the company is expected to focus on its merger with MTS to get the requisite spectrum in majority of the circles for LTE launch. Only in a handful of circles — less than 10 — where MTS and RCom do not have enough spectrum would RCom enter into an alliance with Reliance Jio for spectrum sharing or 4G intra-circle roaming, according to industry sources. 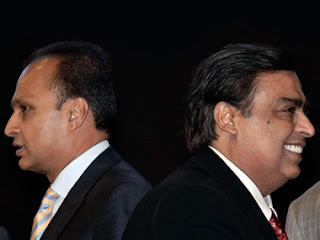 However, in all places, the combined RCom-MTS entity is likely to seek support from Reliance Jio for towers and other physical infrastructure, in addition to its own facilities. MTS has around 3.75 MHz of liberalized, auction spectrum in nine key circles, including most of the big ones such as Delhi, Gujarat, Karnataka, Kerala, Kolkata, Rajasthan and Tamil Nadu. Combined with RCom’s non-liberalized 5 MHz, the combined entity would have around 8.75 MHz of (liberalized and unliberalized) spectrum in these circles, while LTE requires only 5 MHz of liberalized spectrum. To get to that mark, RCom is planning to liberalize one carrier (1.25 MHz), according to industry sources. In the other areas, RCom is likely to enter into spectrum sharing agreements with Reliance Jio where the latter does not have 5 MHz on its own. However, there is only one circle — UP East — where Jio has only partial spectrum. In the remaining eight, Jio has the full 5 MHz on its own, making an ICR the more likely route. Interestingly, Jio’s circles do not overlap with MTS’ circles, giving a synergy for Jio and RCom-MTS to enter into 4G intra-circle roaming pacts in these places. With zero overlap, this would provide both Jio and RCom-MTS a coverage of 18 circles. It is also possible that some sharing or trading of spectrum could be done with Tata Teleservices Ltd, which is also reported to have applied for liberalization of some of its existing 2.5 MHz of spectrum in places like Mumbai, Delhi, Andhra Pradesh and Maharashtra — all locations where it won some extra 800 MHz spectrum earlier this year. In Andhra, TTSL won 3.75 MHz, while in Maharashtra and Mumbai, it won 2.5 MHz each. It also won 1.25 MHz in Delhi and Haryana. TTSL may have to go in for intra-circle roaming agreement with RCom-MTS for accommodating its CDMA subscribers in places like Mumbai and Maharashtra to launch LTE, while in Haryana and Delhi, it would have to also buy an extra 1.25 MHz from them or enter into spectrum sharing to launch 4G.